We offer a wide range of UltraTape specialized Cleanroom Tape products, designed for use in Semiconductor, Electronics, Medical/ Pharmaceutical and Cleanroom Construction industries. These high-quality products are specifically tailored to help our clients achieve efficiency and meet their quality requirements. Since 1992, UltraTape Industries has been producing high quality Cleanroom adhesive Tape products for the semiconductor industries. 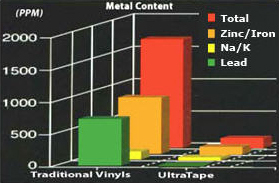 UltraTape specializes in particle-free, non-residue tapes. All products are processed in the cleanroom and utilize sealed, double packaging to ensure reliable, consistent tapes. Ultratape‘s wide variety of tape includes substrates such as Polyester, Polyethylene, PVC, Polypropylene, Kapton, Polymide and utilizes the optimum adhesive technologies whether Acrylic, Rubber, or Polyurethane for each application. UltraTape Industries offers ESD, construction, medical/pharmaceutical, aerospace, electronics, semiconductor and general use tapes, as well as custom manufactured products for use in all critical environments. With the most advanced technology in adhesive materials, UltraTape produces a wide variety of particles-free and residue-free Cleanroom Tapes, Construction Tapes, Double-Sided Tapes that meets critical industrial requirements for multiple applications. Check out our complete range of UltraTape products or contact us for more information.